Most of the parks in this town have been around for quite some time. Rittenhouse Square dates back to the age of William Penn's greene country towne. Capitolo Playground, across from Pat's and Geno's, is a much newer green space and still dates back to the 1950s. So it's rare that we get to see a park born in Philadelphia but that's exactly what's happening right now on the northwest corner of 17th & Carpenter. 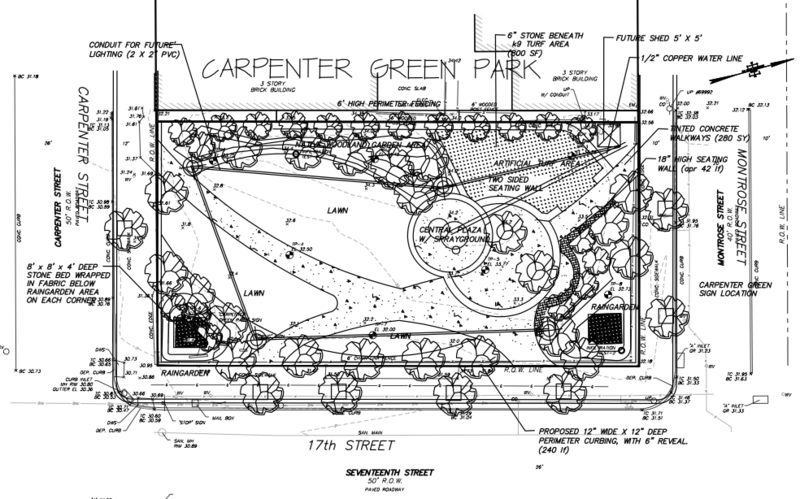 We first told you about plans for Carpenter Green over two years ago when it was far from a sure thing, but if you visit the site today you can see that it is most assuredly happening. We were able to snag an overhead plan for the park from SOSNA, with the promise that a rendering will be provided as soon as one exists. It should be noted, the work happening right now only represents the first phase of construction at Carpenter Green. You can see, the crew onsite has begun digging the rain gardens and their efforts this fall will essentially amount to grading, wiring, and plumbing the site. In order to turn what will be a blank canvas into the park you see above, SOSNA will be stepping up a fundraising effort with an eye toward groundbreaking on a second phase this coming spring. This organization has shown their fundraising chops before, raising money for Julian Abele Park at 22nd & Carpenter and Catharine Park at 22nd & Catharine. If you'd like to make a donation to Carpenter Green, click here. It's worth keeping in mind that the Goldenberg Group has already pledged a $50K matching grant. Speaking of Goldenberg, catty corner to the future park at 17th & Carpenter, we see good progress on the mixed-use building that caps off Carpenter Square. A year ago, when we last visited, the building was framed out in steel to just one story. It's not finished just yet, but you get a good idea of what's coming. And don't forget, there will be a retail space on the first floor and a little public space right at the corner, too. It's really amazing to consider that in just a couple of years, these two corners will have been totally transformed from blighting vacant lots to vibrant assets for the neighborhood. With that in mind, paging the developers across the street… This is not a test. 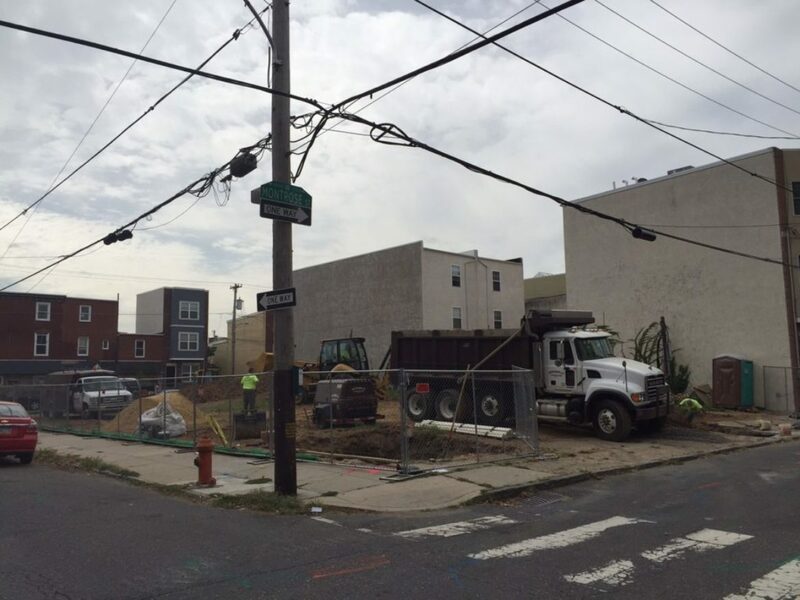 Duplexes coming eventually to the west side of the 1000 block of S. 17th St.